The English Football League Cup, shortened now to EFL Cup or still called merely the League Cup by most old school fans, is now often referred to officially with more weirder names because of sponsorship. At present the official title is the Carabao cup, named after a Thai energy drink brand. The EFL Cup is to the FA Cup what the Europa League is to the Champions League. It is its younger and less respected cousin, seen as being the cherry on top of a successful season for the team that wins it, rather than success in its own right. Fans of clubs that haven’t won it for years derogatorily call it ‘The Mickey Mouse Cup’, but it deserves much more respect than that. Here we’ll tell you all about the competition’s history and explain why it’s wrong to be derogatory of it, as well as talk you through how the format works. We’ll give you some interesting stats about the cup and the players who have made an impact on it over the years, plus we’ll tell you all about the stadiums that have hosted League Cup matches over the years. The FA Cup is seen as the more prestigious trophy for a number of reasons, the main one being that pretty much every team that wants to enter it can do. Non-league teams have just as much right to compete in the FA Cup as the ‘bigger’ teams higher up the divisions, making it a competition for the everyman. The League Cup, by contrast, is only open to the 92 teams that are part of the Football League. Yet doesn’t that mean it’s a stronger competition than the FA Cup? Surely the fact that you need to be good enough to be in the top four divisions in England to qualify means that the League Cup is the competition for the elite? For whatever reason that’s not the case, and the League Cup will only ever be viewed as England’s second most important domestic cup competition. More’s the pity. As far as qualification goes, though, all you need to do is be one of the 92 teams that makes up the Football League and Premier League. 24 League Two teams, 24 League One teams, 24 Championship teams and 20 top-tier teams qualify for the competition every season, though they enter it at different times. The League Cup is organised in such a way that the third round involves just 32 teams from the 92 that entered it at the start. This can be slightly tricky to sort out, with byes to the third round of the competition being given to any team that is involved in European competition at the start of the season. That is normally the top four teams that have qualified for the Champions League and the fifth placed team that goes into the Europa League, as well as the winners of the FA Cup and the League Cup that also qualify for the Europa League. The complications arise when the teams that win the FA Cup and League Cup have also already qualified for European competition through their league position. In this case the extra European place goes not to the losing team from the cup finals but instead to the next position down in the league. It means that there can be anywhere from seven to nine teams involved in European competition that get byes to the third round of the League Cup. The first round involves 72 teams from the bottom three tiers of the Football League. They all play each other at random thanks to a draw that decides which team will play the tie at home. They are all one-legged affairs and it is a standard knockout competition, meaning that 36 teams progress to the second round. At that stage any Premier League teams not involved in Europe enter the cup, though obviously it needs to be an even amount of teams heading through to the third round. For that reason, if an odd number of teams qualify, a bye may be given to a team through to the third round. It is normally 12 teams that are added to the 36 for round two, with those teams playing each other in order for 24 teams to progress to round three. The 24 teams that have advanced from the previous round are joined by the 8 teams that received byes to the third round, with those 32 teams going head-to-head to decide who should progress to the next stage of the competition. The third round is the final round at which teams join the cup despite not having played in previous rounds. There are no replays in the League Cup, with extra-time and penalties being played immediately if necessary. The joy of a knockout competition is that once you’ve got past the complicated system of byes and qualification criteria it’s really easy to understand how it works. The League Cup is no exception, with the last 16 become 8 quarter-final teams thanks to victory in the one-off matches that were played in the fourth round. The quarter-finals are also one-off games played at the home ground of the first team taken out of the hat when the draw takes place. The semi-finals are the only games in the League Cup that are not one-off ties. Instead they are played over two legs, with each team involved playing one of the legs in their home ground. The first name drawn from the hat when the draw takes place plays the first game at home and the second leg away, something of an advantage as far as qualification for the final is concerned. The final is a one-legged affair that occurs at a neutral venue, namely Wembley Stadium. If the scores are level after 90 minutes then a period of 30 minutes extra-time is played. If the scores are still level then the match goes to penalties in order to decide the winner of the competition. It’s quite exciting, when you think about it. Extra time was scrapped for all rounds apart from the final. If level after 90 minutes teams progress straight to penalties. The ABBA penalty trail was discontinued and replaced by the traditional ABAB system. Seeding was removed for the first two rounds, however round one is still organised on a regional basis. VAR can be used at Premier League club grounds. Away goals rule scrapped for the two legged semi-finals. The League Cup was created as something of a tool for the Football League to battle the Football Association and to combat the ever-increasing popularity of European football. The idea for the competition originally came from the mind of Stanley Rous who thought teams that had been knocked out of the FA Cup should still have something to play for. It wasn’t implemented by him, however. Instead Alan Hardaker, who was the Secretary of the Football League, suggested it might be a good way for teams to make money that was going to be lost due a planned reorganisation of the league. The league’s reorganisation didn’t actually happen as expected, but the League Cup was introduced for the 1960-1961 season, with Aston Villa winning the two-legged final by 3 goals to 2. During the 1950s match day attendances had been dwindling and Hardaker hoped that the new competition would bring some of the prestige back to the game. There was also a huge degree of tension between the Football League and the Football Association, with disagreements about how revenue should be shared between clubs chief amongst the concerns. Plus ça change. The League Cup was seen as a revenue generator thanks to the proliferation of the use of floodlights in the league. It meant that the matches could be played on midweek evenings, thereby not interfering with the already jam-packed football calendar. It was introduced specifically as a floodlit tournament and replaced the limited and not very popular Southern Professional Floodlit Cup. Perhaps part of the reason that the League Cup is not particularly well respected nowadays comes from its inauspicious beginnings. The European Cup had been launched just five years prior to the League Cup’s formation and many of the bigger clubs in England felt as though the new cup would limit their chances in the more prestigious competition. The Times’ football correspondent wrote, “The Football League propose next season to implement their useless Football League Cup to be played in midweek. It gets the players, the clubs and the public nowhere”. Sixteen clubs opposed the formation of the League Cup, with thirty-one approving it. Aston Villa were the overall record holders for trophies when they won the inaugural cup final in 1961, but its popularity wasn’t helped by the next three winners of it never having won a trophy before, lending credence to the idea that it wasn’t a difficult competition to win. The League Cup allowed the Football League a touch more negotiating power with the FA and UEFA. Hardaker suggested that Football League clubs would boycott the Fairs Cup if UEFA didn’t allow European qualification for the winners of the League Cup, leading to UEFA to promise exactly that on the condition that the winners had to be in the First Division. This led to bigger clubs starting to take the competition more seriously, with the promise of European football exactly the carrot that they needed to try and win it. From its inception up until 1966 the final was a two-legged affair, with each team hosting one of the matches. After 1966, however, it became a one-legged final with replays as necessary if no team won it outright. That changed in 1993-1994, when only one replay took place of any single-leg tie in the competition and penalties introduced at the end of the replay if there had been no winner. Ever since 1998 all finals have been eligible for extra-time and penalties in order to help decide the winner. As soon as the decision was taken to play the final over one-leg a neutral venue was needed to host it. 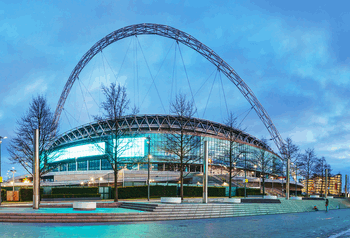 Wembley was the obvious choice for said venue and the League Cup’s final has been played there since 1967. It is not the only stadium to host finals, however. Replays weren’t played there, so stadiums such as Hillsborough, Old Trafford and Maine Road in Manchester were used to host final replays on numerous occasions over the years. Much like with the final of the FA Cup, a new venue was needed during the reconstruction of Wembley from 2001 until 2007. That new venue was the Millennium Stadium in Cardiff, used to host the League Cup final from 2001, when Liverpool won the first one there much as they did the first FA Cup held in the stadium later that same year, until 2007 when Chelsea beat Arsenal in a London derby cup final. From 2008 until the present day the final of the League Cup has been held at the new Wembley Stadium. The 12 finals to date have been won by seven different teams including Swansea, becoming the first team from Wales to win the competition which they did when they beat Bradford City in 2013. Manchester United have won the League Cup three times since the final was moved to the new Wembley and Manchester City four times. City have now won the cup the second most times after Liverpool.